BluBØX Security Inc. today announced a partnership with PSA Security Network to distribute its web-cloud security system that provides access, alarms, visitors, video, and biometrics for the physical security industry. 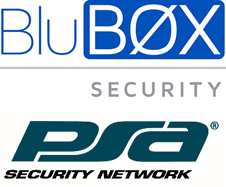 BluBØX Security Inc. today announced a partnership with PSA Security Network to distribute its web-cloud security system that provides access, alarms, visitors, video, and biometrics for the physical security industry. Through the new partnership, PSA Integrators will be able to offer their customers a security system built with the latest Cloud, Web, Mobile and Biometric technology. BluBØX Security Products create high margin recurring revenue (HMRR) for the integrators and lower upfront and total ownership costs for their customers. PSA Security Network is the world’s largest electronic security cooperative, owned by the most progressive security integrators throughout North America. The cooperative generates over $2B in annual sales of security, fire, and life safety systems. BluBØX is the only U.S.-based manufacturer and service provider of a true Microsoft Cloud-hosted physical security product that provides Access Control, Alarm Management, Video Surveillance, Visitor Management, Biometrics, and Elevator Destination Dispatch in a single unified platform. The system can be accessed from any device, anytime, anywhere and all functions are unified under a single database and user interface. This End-to-End solution was designed to provide cost-effective Enterprise-level functionality, but readily scales to meet the simpler needs of Small and Medium-size Businesses. “Our successful track record and the lessons learned from our first cloud security company provided the background to create a solution that both the Integrator and End User want. We are excited to be able to provide our competitive offering to PSA’s Integrators to help migrate their existing customers and attract new ones to this modern way of providing security,” says Patrick Barry, CEO of BluBØX Security Inc.
BluBØX’s flagship security product, BluSKY, is a simple yet powerful web-based Microsoft hosted security software platform that unifies all major security applications and works with any browser on any device, anywhere, anytime. BluSKY is patent-pending for its innovative real-time monitoring, status, and control of any number of security systems without the need to load or manage software on any device. BluSKY also provides an out-of-the-BØX cross-system, multi-site partitioned database for multi-tenant and large multi-site installations. BluSKY works with authentic Mercury hardware and can upgrade any of the 20+ Mercury-based systems in the marketplace to a modern mobile-web-cloud architecture. BluBØX’s Person Reader is a patent-pending multi-factor and multi-biometric reader that grants users access through a portal without the need for credentials. The Person Reader is a more secure and convenient replacement for cards and card readers and can be used anywhere you would use traditional access control. The Person Readers can be used to complement card readers or simply replace them altogether. The Person Readers are simple and natural to use: just look and be recognized. BluBØX Security Inc. is a U.S. manufacturer and service provider of web-cloud security systems that delivers the unprecedented unification of access, alarms, visitor, video, and biometrics. BluBØX has set a new standard, Security 4.0™, which enables the most powerful, cost effective and scalable security solutions to be experienced in vivid simplicity on any mobile device, anytime and anywhere. BluBØX Technology Holding Inc. is responsible for the development, acquisition and protection of high barrier to entry intellectual property.